Use for Infectious Waste or Linen or for any purpose where a lid is required. Three sizes available. 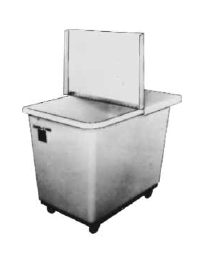 Includes 100% Galvanized Rust-Proof Steel Base and 3 1⁄2″ Casters. Choice of caster arrangement. Comes in .190 Wall Thickness and your choice of several colors. Lid color is White.